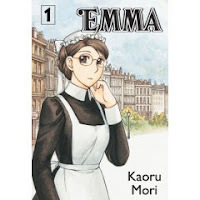 Emma Volume 1 by Kaoru Mori. Copy donated by publisher, CMX, in support of Cybils. Cybils long list. The Plot: Set in Victorian England. Emma is a maid; she meets a gentleman, William Jones. As the book copy says, "an upstairs gentleman and a downstairs servant share a secret love." The Good: Ah, romance, as Emma and William exchange glances and William does things like leaves a glove behind to ensure a second meeting. There is a lot of quiet in this book. Emma says little; she is quiet, shy, almost to the point of being a shadow. Because so much is not said, the illustrations become very important; it's how the reader knows what is going on in Emma's head. They are full of details; reading the dialogue and skimming the pictures means you'll miss parts of the story. Along with the quiet there is a sense of slowness; a leisurely pace, almost, as the characters navigate the structure of their world. William may like Emma, and she him, but there is no rush. There is hesitancy. What else? There are hints that there is something more going on, with both Emma's own background as well as that of her employer/mentor, Mrs. Stowner; despite Emma's reticence, or perhaps because of it, she has quite the few men falling for her. Yet at all times she is the proper young maid. The final test for me: do I want to read more? Do I want to learn more about Emma and to find out whether Emma and William get together despite their class and money differences? Yes, yes, yes! At this wikipedia entry on the series, I found out that not only has the book inspired such things as an Emma cafe, but also that Mori is very sensitive to the question of historical accuracy, to the point of hiring a historical consultant. Rating: most manga is rated for the entire series; this one is T+, Teen Plus Suggestive Situations. While I didn't see anything really in this one, I'm assuming that the rating is earned in future volumes. Glad to hear you liked this one Liz. I did too. It was great working with you for the Cybils. I had a blast!